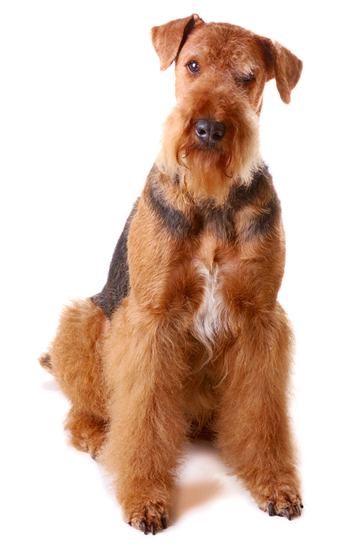 Learn about the temperament and personality of the Airedale Terrier. Discover what he's like to live with, his traits and characteristics and how he generally behaves. And look at lots of Airedale Terrier photos. The Airedale Terrier, the "King of Terriers," is brimming with personality. He has the trademark terrier temperament: energetic, curious, feisty, and boisterous. He thinks he is a comedian and will provide you with years of comic relief. He craves your attention and will act out to get it. They are intelligent, and quick learners, but they certainly think for themselves, so their idea of "trained" might differ from yours. They are notoriously unreliable on the recall. They seem to think everything over. They like to work with you, not for you. They seem to be born mischievous and act like puppies until they are about two years old. They like to destroy doggie beds, shred newspapers and eat rugs. They also love to dig. They will also steal laundry and food. They like to find their own adventures in life. To minimize their misbehaviors, it is imperative that you give your Airedale daily exercise. They enjoy doing most anything you do: hiking, jogging, backpacking, canoeing, camping, and agility. They are loyal, devoted, and protective, and will bark when someone approaches the door. They are excellent watch dogs! The Airedale will certainly stand his ground (one time that the stubbornness works for you). The Airedale is a terrier, and will chase small animals. They are not reliable with cats, unless they grow up with them, and even then, it's not a sure thing. Some Airedales are aggressive with other dogs. Airedales do wonderfully with children, but these are large, exuberant, high energy dogs with head-butting enthusiasm who like to roughhouse. They can injure a young child without ever meaning to, so many breeders recommend they don't go to homes with young children. Airedale parents need to keep a close eye on their dog's health, because Airedales rarely show pain. They can be seriously injured or really ill and still be wagging their tail. If an Airedale is for you, then you will need to be devoted to a high maintenance, high energy member of your family. They need your affection and attention and they will want to supervise everything you do. With careful, diligent, patient training and parenting, the Airedale can be the best family pet in the world, but you have to be the right family. You need to be okay with a rowdy, jolly joker helping you run your house! The Airedale Terrier is intelligent and quite easy to train. He learns new commands quickly at an above average rate. The Airedale Terrier sheds practically no hair at all. You'll virtually never find a hair in your home!